Lotus Martin made Linguine with Clam Sauce at every occasion she could. Whether or not it made sense, the big silver pot of garlicky goodness just seemed to work with whatever was going on: Easter (with Chinese buffet), July 4th (alongside barbecue), Halloween (with grape eyeballs), Thanksgiving (next to turkey), Christmas (with prime rib). Lotus, more than an aunt, more like a mother, was a major influence in my life. As I grew up, I learned to cook from Lotus, and this recipe was one of the things she taught me. The first time I watched her cook it, it seemed like a terribly haphazard process: Glugging what looked like an insane amount of olive oil into a pan, filling the pan to the brim with a ton of other liquids and chopped up stuff, and just when I thought it couldn’t handle any more, it would end with an enormous amount of buttered pasta. Once tossed to combine, it would miraculously create the most delicious, the most luxurious, and the most comforting pasta dishes I’ve ever eaten. Of course, I wanted to cook it with her. When I asked her for the recipe, she produced a tiny, stained square that had been cut from the back of a pasta box. As I followed the directions and chopped what I thought was a ¼ cup of parsley, she’d say, “chop some more.” After I crushed and minced 3 cloves of garlic, she told me, “do a few more.” When it was time to add the vermouth, she urged me “keep going.” I soon learned that Lotus didn’t follow recipes. As in life, she might follow a format, but just kept going and cooking until things just felt right. That was how she did it. She also taught me to be okay with mistakes. That first time I cooked this recipe, I burned the hell out of the garlic. But I didn’t know it. She let me continue with the recipe, and when I tasted the sauce, I exclaimed, “ew!” She said, “that’s okay, Toots.” She emptied the pan and we started over. The next time, I watched carefully as the garlic sizzled and just started to brown. “Now,” she said. And as I poured the vermouth into the pan, and the olive oil swirled and created lovely shapes, and the aroma hit my nose, I knew I could create beautiful, wonderful things by cooking. She taught me these things, and she taught me to share my love of cooking with those I care for and love. This recipe is in honor of Lotus. It’s not as good as hers and it will never be, because she’s not here to cook it, and she’s not here to tell you about how this batch isn’t quite as good as it should be because of this, that, or another thing. But it really does remind me of her. And I’ll settle for that. *Most jarred clam juice is more flavorful than that from the canned clams. Fill large stock pot with 6 quarts water. Season liberally with salt, and bring to a boil. Cook linguine according to package directions until slightly under al dente; drain, reserving two cups of liquid. Meanwhile, heat olive oil over medium high heat. Add garlic cubes and cook, until just melted and beginning to sizzle, about 30 seconds. Do not burn. Add vermouth or white wine, and clam juice. Increase heat to high. Bring to a boil for 30 seconds, and reduce to simmer. Add clams, basil and half the parsley. Season to taste with white pepper, black pepper, salt, and Aleppo pepper. Swirl in butter. Add pasta to sauce, stirring to mix well. Cover and simmer over very low heat, until most liquid is absorbed, about 10 minutes, stirring occasionally. Stir and add reserved pasta cooking liquid if needed to moisten. Sprinkle with remaining parsley and serve. Gary, what a touching story. I can hardly wait to try this. I love Lotus.....for what she did for you and the way you want to carry it on. Oh man, that was beautiful. 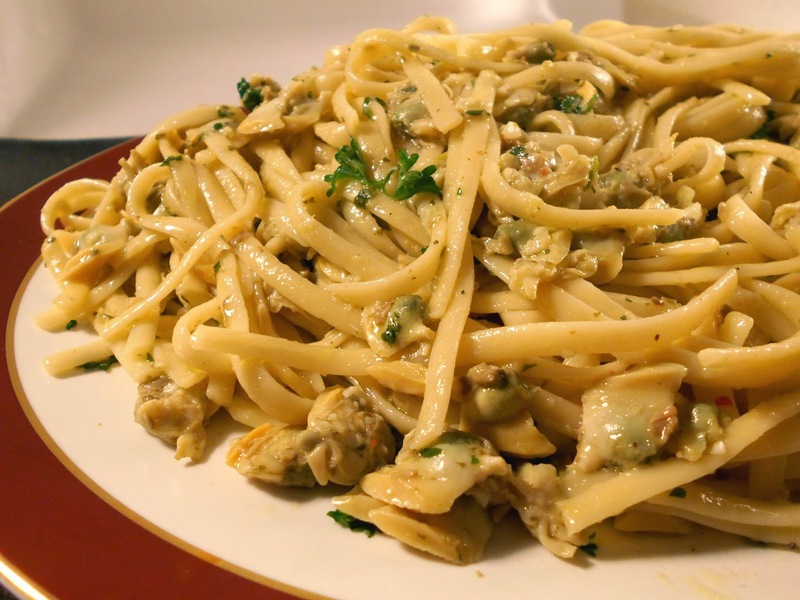 Linguine with white clam sauce is one of my favorites. Definitely going to try Lotus' recipe, Toots. Gary, I forgot to post a note here that I made this twice. Once for my husband who loves clams and linguine and anything containing the two. He loved it. Then I made it for my parents when they were in town. They were really skeptical when I told them what I was making. Apparently they only like fried claims. Well, they both loved your recipe, of course, I knew they would. What I didn't realize is how much our daughter liked it. She had it on both occasions and guess what? Today, she called me. Mom, I am cooking dinner tonight for guests. I am thinking about making Gary's linguine and clams. Then she said she was worried because she had no Aleppo and no white pepper. I told her to read the recipe. Then she would know that Lotus and Gary both want her to follow a format and just keep going until it tastes right. She used cayenne and she used black pepper. The dinner was a smashing success and she is grinning ear to ear, I can feel it in her texts to me. I asked her if she took a photo to share with you. No, Mom, that part I got from you...the light was not quite right. Thank you again for sharing this Gary. It's a keeper and so are you. xoxoxo. Thanks to everyone for the great comments! Since this recipe posted, I've been asked to share Lotus' Linguine with White Clam Sauce recipe for the Instant Pot. And here it is, for a DOUBLE BATCH! Heat Instant Pot on Saute. When "HOT", add olive oil; heat until shimmering. Add garlic, and stir until fragrant, about 10 seconds. Add vermouth, stir, and allow pot to heat until boiling. Boil for about 2 minutes. Add clam juice, clams and their liquid, basil, half of the parsley, the peppers, and salt. Stir and allow to come to a vigorous boil. Add dry pasta, swirling in the hot liquid to soften. Gently swirl and press pasta down into liquid. When pasta is submerged, scatter butter cubes all over. Lock lid in place, hit "Cancel," then "Manual," and set cook time for 6 minutes. Allow NPR for 8 minutes, then carefully release pressure. Remove lid and gently stir pasta and sauce, separating any clumped strands. Replace lid and let sit for another 5 minutes, or until sauce is almost absorbed and clams are evenly distributed. Check seasonings (probably needs more salt) and turn out into a large bowl. Sprinkle with remaining parsley and serve. I made this for Easter at my sister's house and I thought my brother was going to eat the whole pot all by himself! Everyone was amazed by how good and quickly this came together so I added the "recipe" here to share. What a great idea to make it as a dish to serve at Easter! Next time you make it on a holiday tell me and I will too!